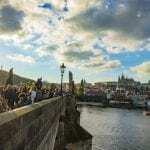 While this city is totally under-rated a curious traveler will find loads of things to do in Olomouc Czech Republic. 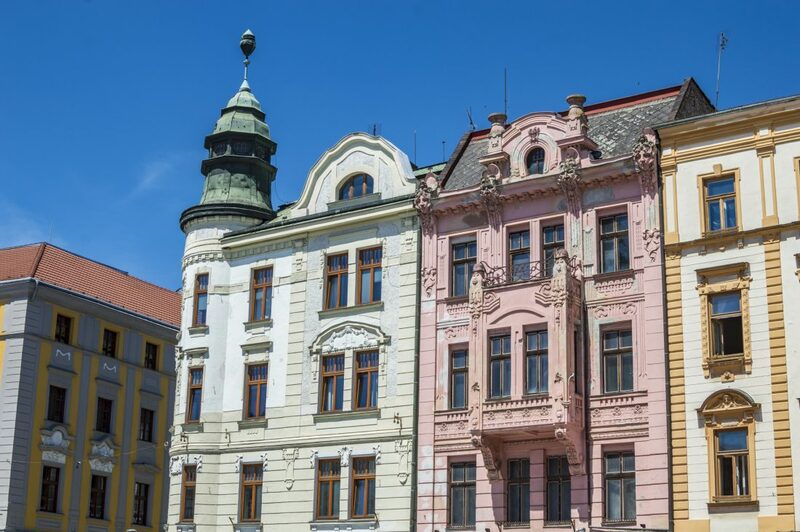 The Czech Republic (or Czechia, as some are calling it) is a country of only 10.5 million people, so it shouldn’t come as a surprise that peace and tranquility is easy to find in its 6th largest city of Olomouc. It’s especially easy to explore Olomouc Czech Republic in peace during the warmer summer months when the 25,000 university students flee the Moravian city for their summer holidays. 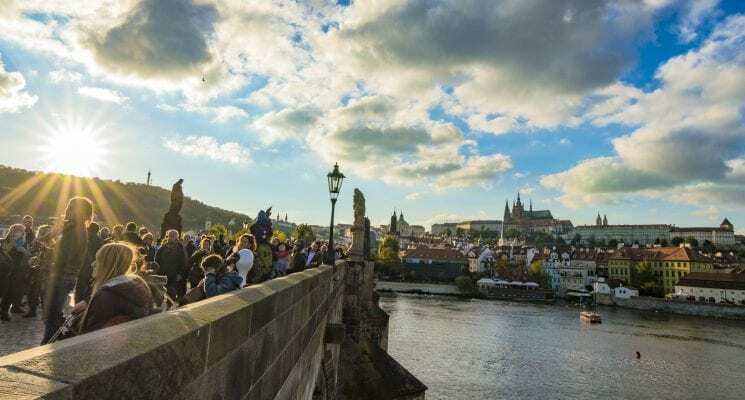 This anual exodus leaves behind a quiet playground for curious tourists looking to explore the Czech Republic beyond Prague. 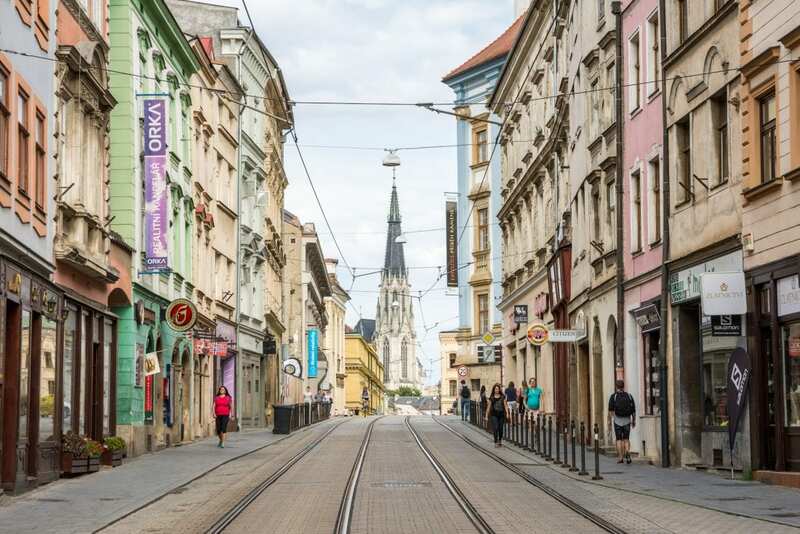 Visit Olomouc in August and find a rather empty city, return in January and you will find a lively university town, brimming with enthusiastic students. Olomouc is a mere two hours by train from the Czech capital, so you can visit this city on a day trip from Prague. Conversely, you can stay over night to get a feel for nightlife and ambiance. 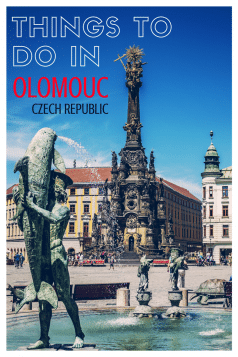 Either way we very much suggest making time and fitting Olomouc into your travel itinerary, especially if you are spending a week of more in the Czech Republic. One might easily be tempted to spend hours a day people watching in this laid back city, because let’s face it, sometimes you just need to kick back and relax when you travel. However, that would be a mistake, because there is a lot to see and many things to do in Olomouc. 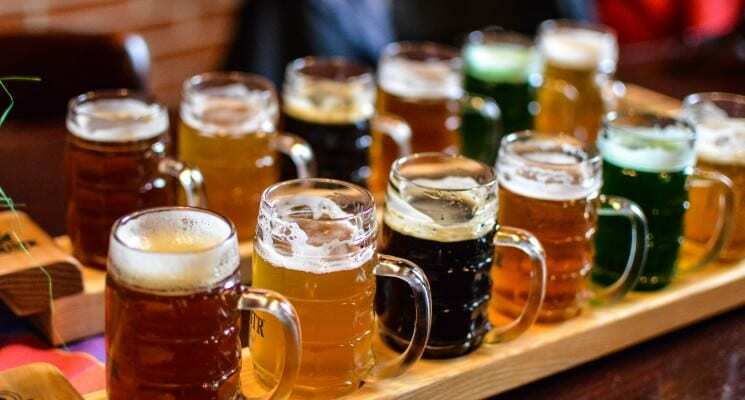 But don’t worry, as we said above this isn’t exactly a huge city, so you’ll still have plenty of time to enjoy a cup of coffee at one of Olomouc’s many cafes, or a few beers in it’s pubs. 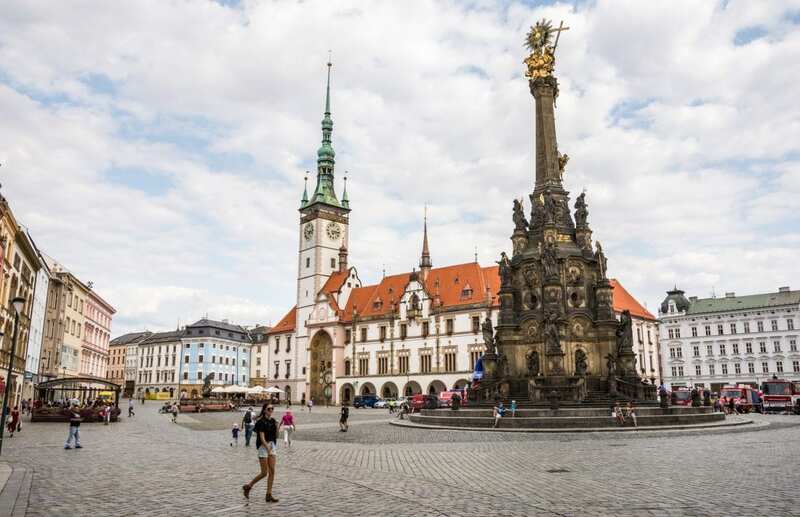 From the blatantly obvious, to the somewhat off the beaten path, here are some of the best things to see and do in Olomouc. The easiest and cheapest way to get to Olomouc from Prague is by train. The journey is a super easy 2-2.5 hour train ride from Prague. Trains run from the main train station in Prague to Olomouc one to two times an hour. The price of a ticket starts at 220 kc one way. Train tickets to Olomouc from Prague can be purchased in advance here. Olomouc has not one but two squares, the Upper Square (Horní náměstí) and Lower Square (Dolní náměstí), both of which are located in the city center and steps from one another. You’ll undoubtaly visit both while exploring the Old Town. 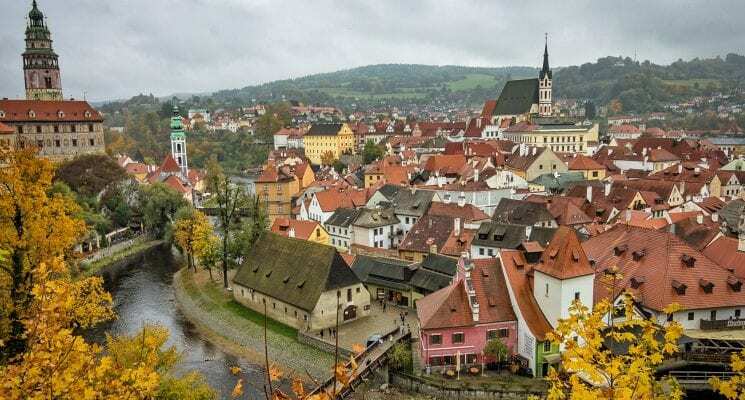 The two squares are a bountiful cornucopia of treats any visitor can happily fest their eyes upon, including colorful and historic buildings, ornate fountains, a towering Holy Trinity Column, and the unusually decorated astronomical clock carved into the impressive Town Hall. The Holy Trinity Column is comprised of the largest collection of Baroque statues in Central Europe (36 in total). It stands 32 meters tall and towers above the crowds adoring it from below. The column was constructed after the end of a plague in Moravia in the 1700s to show gratitude and to celebrate the catholic church. The impressive column is a sight to see. Anyone, including artists, children, the devout, and the curious tourst will marvel at its incredible beauty, especially on a sunny afternoon when it’s cloaked in a glorious golden sheen. Olomouc’s Town Hall, which still serves as the seat of the municipal government, dates back to the 15th century. This impressive structure stands tall in the center of the Upper Square next to the Holy Trinity Column. The Town Hall is home to a 75 meter high tower and the only astronomical clock in the Czech Republic outside of Prague. The clock was originally constructed in the 1400s but was destroyed by German troops during World War II. In the 1950s Czech artists Karl and Marie Svolinský redesigned the clock with the new communist party in mind. Today the clock comes alive once a day at noon, playing three Czech songs from the region while numerous communist characters perform. 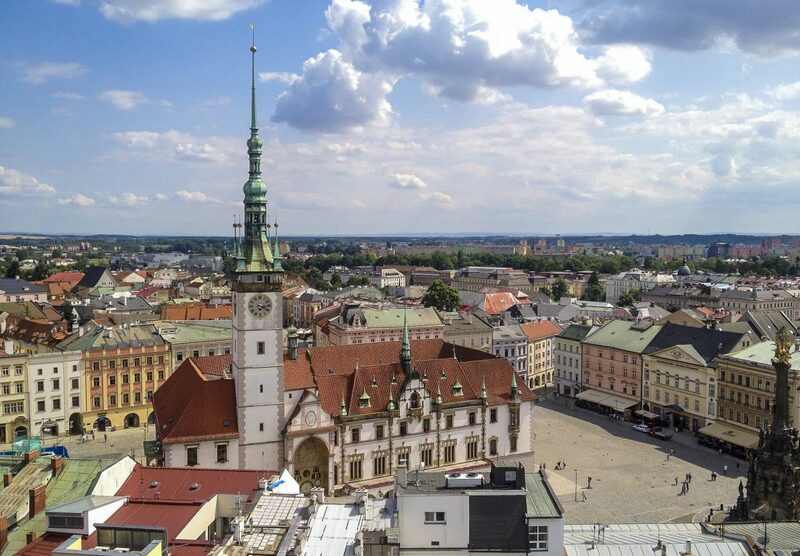 Daily tours of the Olomouc Town Hall Tower are on offer between 11:00 am – 3:00 pm. 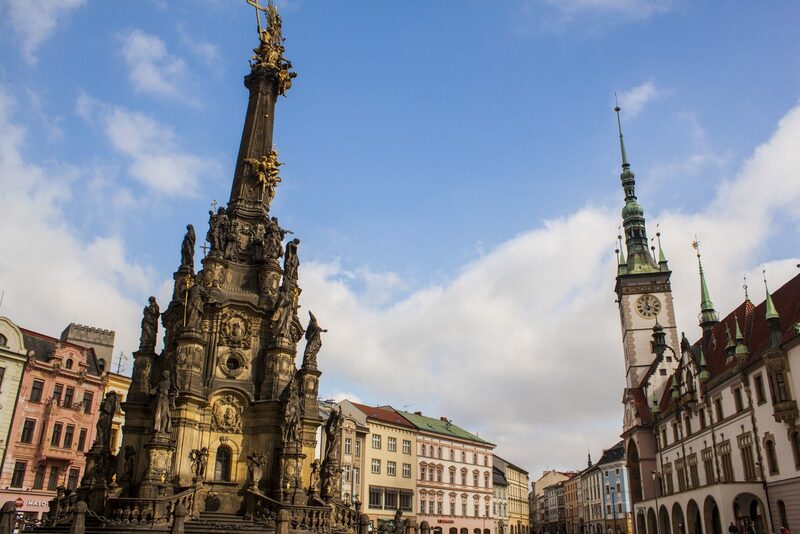 The most notable site in Olomouc’s Lower Square is the Baroque Marian Column, a beautiful tribute to the Virgin Mary. The column was erected in 1724 as thanks to the saintly mother for protecting the city from a plague that claimed the lives of many Moravians in the early 1700s. Never before have we seen such an unusual collection of fountains than those that exist in Olomouc. There are eight in total, including six from the Baroque era that pay tribute to mythological and historic figures. Each fountain is worth a visit but here are our favorites. Located at the Southwest corner of Olomouc Town Hall lies Arion’s Fountain (seen above). This modern construction seems completely out of place in Olomouc but, like many of the other statues, is based on a mythological tale. Arion’s Fountain, which includes turtles, fish, and a dolphin is a menagerie preserved in time to pay tribute to the Greek singers seafaring savior. If, like us, you’re wondering why Arion is embracing a dolphin in such an intimate way you can read more about the legend here. 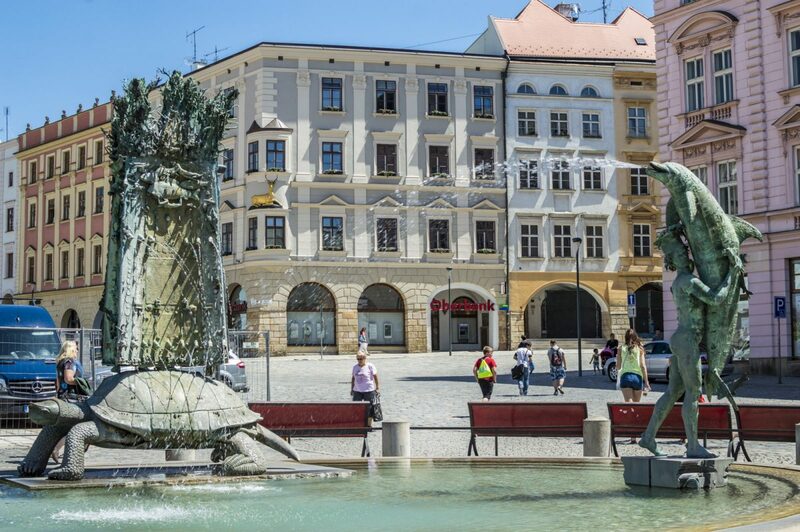 Dating back to 1683, Neptune Fountain is the oldest in Olomouc. As the name implies, the fountain is devoted to the Roman god of the seas, Neptune. 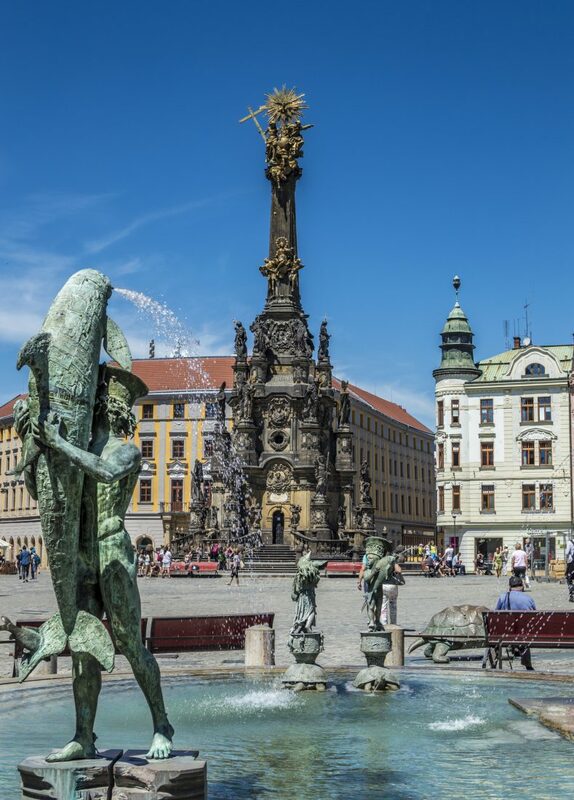 It’s said that his trident points down to calm the fountain waters; a symbol of Neptune’s protection over Olomouc. The fountain includes a mysteriously dark and brooding Hercules wielding a massive club in one hand and an eagle, the symbol of Olomouc, in the other. The cloaked figure’s feet are entangled in a seven-headed hydra, which he is courageously protecting the eagle from. 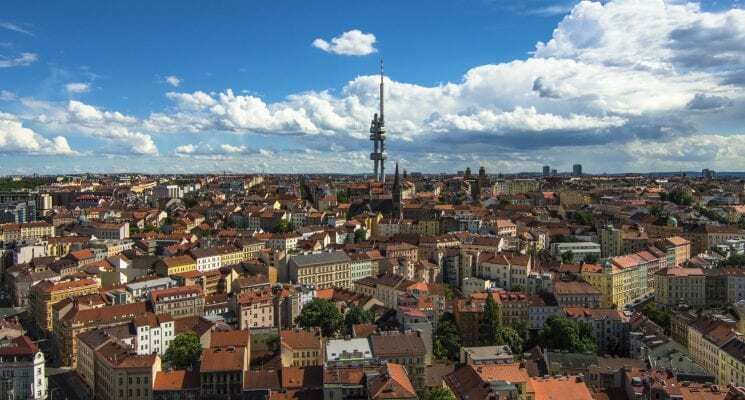 A sunny summer day is the perfect time to visit Saint Wenceslas Square in Olomouc which is tucked away on the edge of the city center atop a small hill. The surrounding area is the oldest part of the city, and sadly one of the least visited by tourists. Once inside the peaceful square the first thing you’ll notice is the towering Saint Wenceslas Cathedral, which takes center stage. 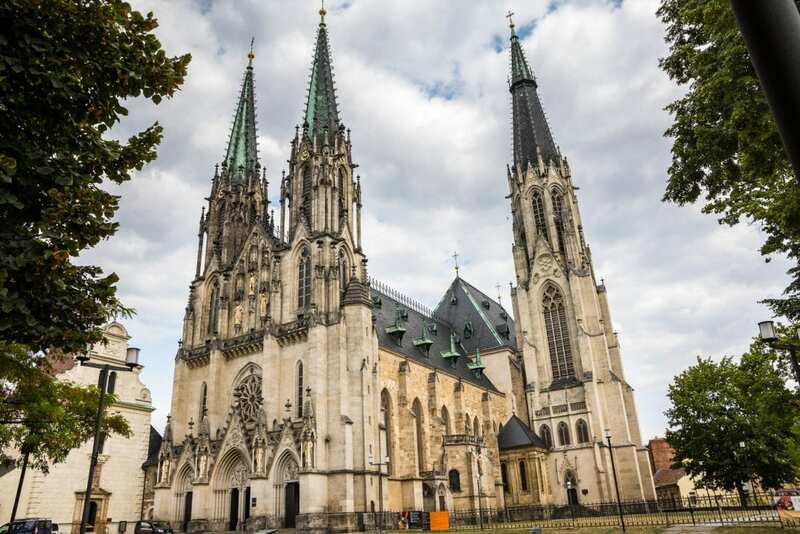 The cathedral is the proud owner of the second highest tower in the Czech Republic, at 100 meters tall. There is no entrance fee so some time inside admiring the intricate and colorful stained glass windows, towering arched ceilings, and beautiful religious sculptures and relics is a must. Once you’re done gawking at the interior of the Gothic Goliath step outside and look around. The square is also home to the Romanesque Bishop’s Palace, Chapel of St. Barbara, and the Archdiocesan Museum, all of which are worth at lease a few moments study. 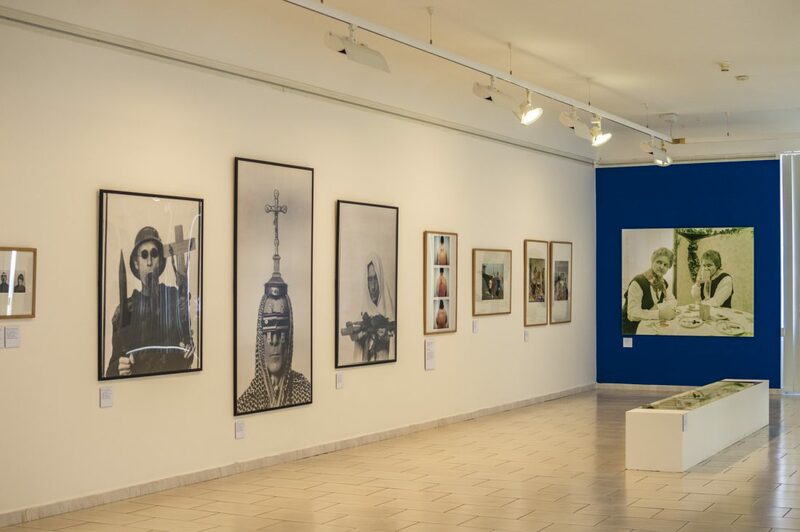 If weird and wonderful art is your thing, set your bags down in your hotel room and head straight to the Olomouc Museum of Modern Art. 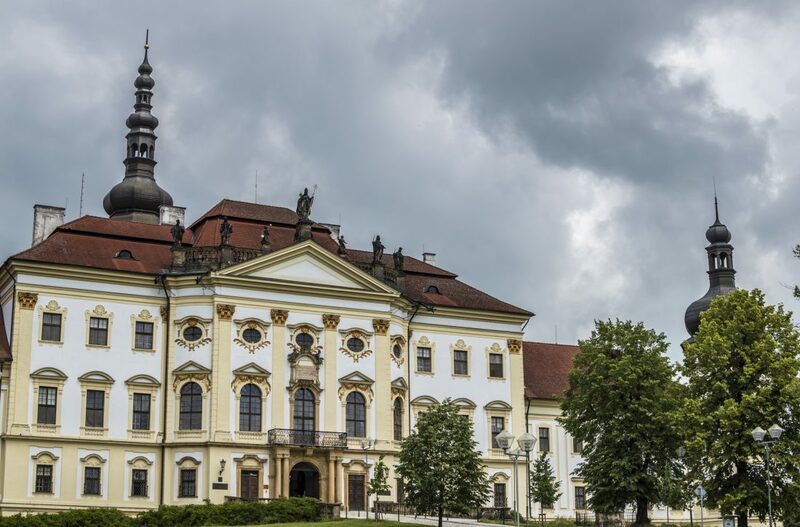 This small museum is packed to the gills with wonderful Czech and international modern art, hosts both short and long term exhibitions, and has a permanent exhibition of Dutch 16th to 18th century paintings. 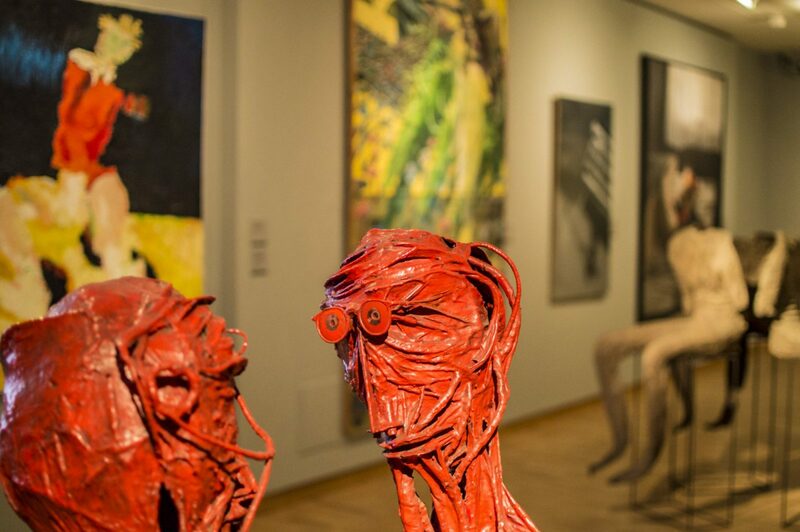 Fans of Czech sculpture will feel like a kid in a candy store with unusual works from artists like David Černý, Karel Nepraš, and Zbynek Sekal. 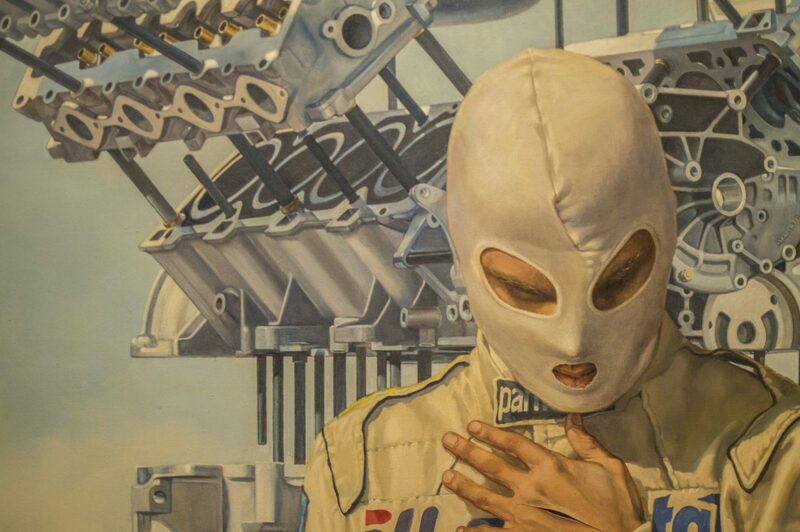 We were lucky enough to view “Fascination With Reality“, a hyperrealism exhibition on display between April – September 2017 when we visited. Despite the exhibition’s title the works on display all have a dream-like quality, and in fact many are downright nightmarish. Walking up and down the polished wooden aisles, from one work to the next, while trying to make sense of the subtle (and sometimes blatant) madness was quite a jarring experience for the mind and soul. 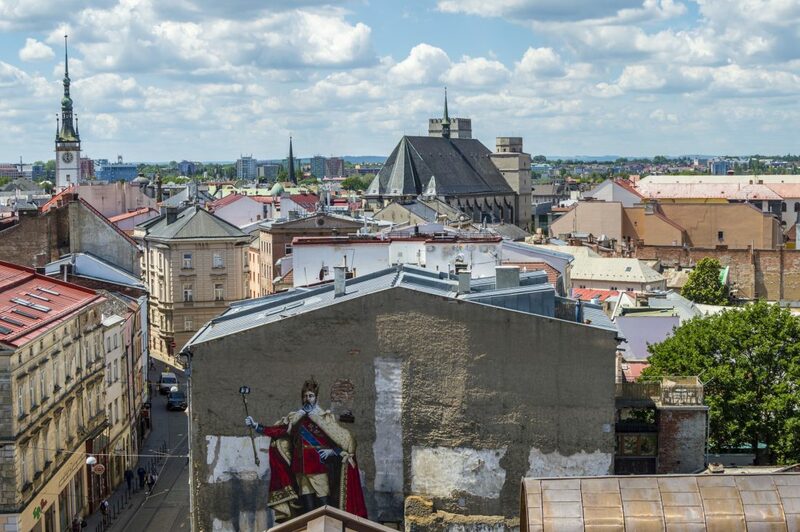 Tip: While on the third floor of the museum climb up the winding stairwell for a great view of Olomouc. Moravia is known for outstanding wine. 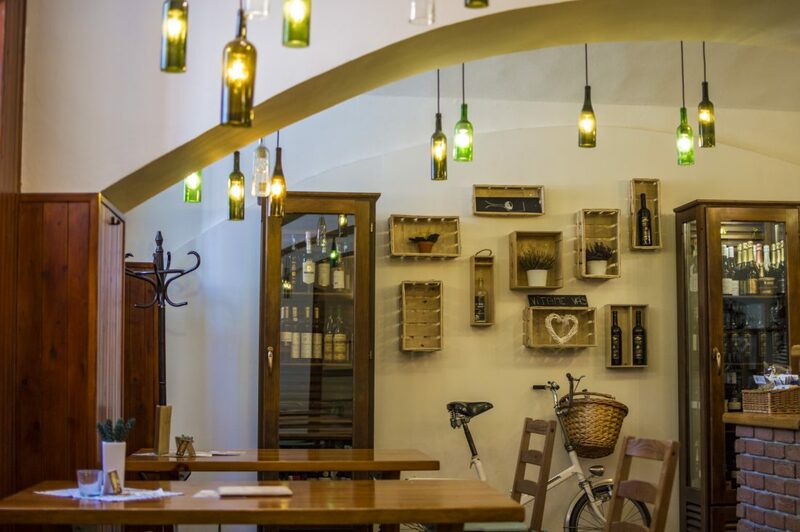 Luckily Olomouc has plenty of wine bars to sample the region’s liquid delights. When the mood strikes, and you’re ready to sample the region’s treats, we recommend heading straight for Vinotéka Kaštánek. This intimate wine bar offers a multitude of wines on tap to sample. You can enjoy a glass or two at one of their three tables or get a liter to go and head to the nearby Bezruč Park for a peaceful afternoon picnic. 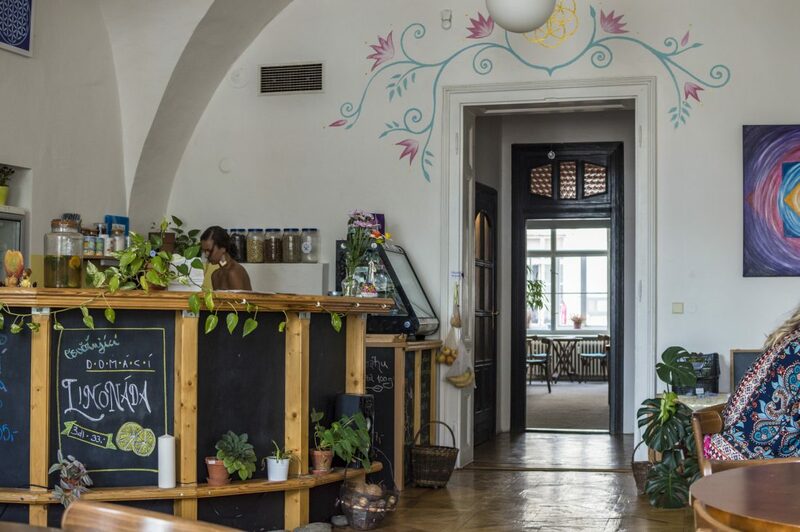 Živá zahrada – Actually a restaurant but they serve really nice coffee and tea as well as sweet raw vegan desserts. Café la Fée – French style cafe serving high quality coffee, tea, wine, food, and desserts. Tip: sit in the front room by the window for plenty of people watching opportunities. Sophie’s Café – Cafe located on the ground floor of Miss Sophie’s Hotel. Excellent food, coffee, and atmosphere accompanied by fantastic and friendly service. Long Story Short Cafe – Cafe located at the Long Story Short hostel. Wonderful coffee, desserts, and incredible Chlebíčky (open faced sandwiches), including a vegan option with tofu and hummus! 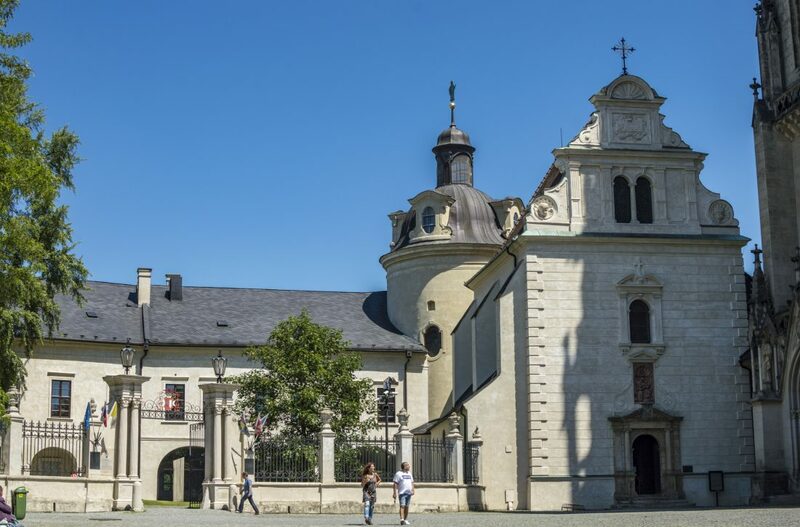 A short 15 minute walk from Olomouc lies the Hradisko Monastery. Built in 1078 as a Benedictine monastery it was converted into its current state as a military hospital in 1802. The monastery, with four wings, towers, a convent, and a moat, is spread out over one hectare of land. 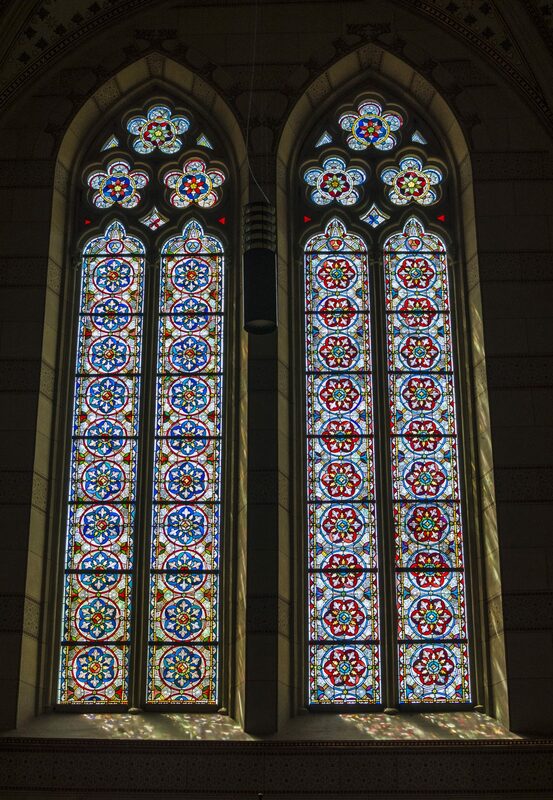 Be sure to go on Thursdays or the first Saturday of the month for a tour of the interior. Olomouc is a great place to get a bit of shopping done. The town is host to myriad second hand clothing shops, shopping centers, and boutique shops. You can easily devote an entire day to shopping if you so wish. 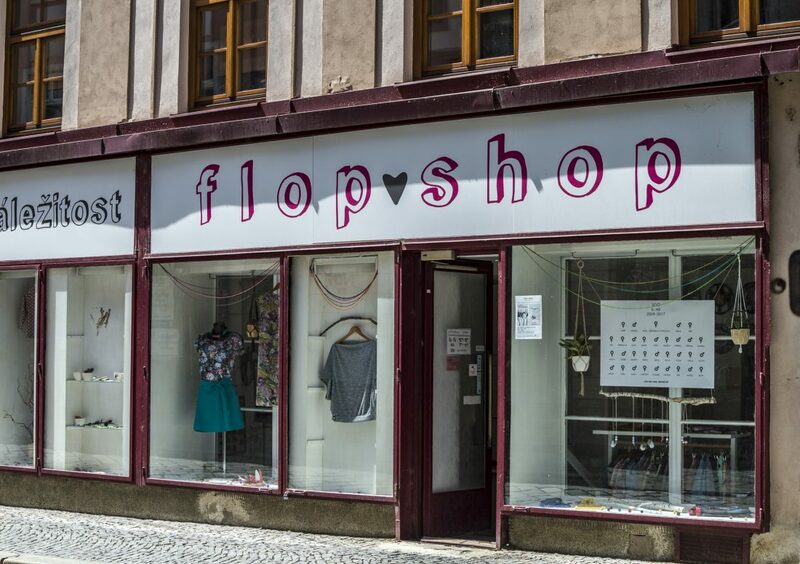 Make sure to check out Flop Shop while on your shopping jaunt. This little boutique exclusively sells Czech brands and the prices are very affordable. 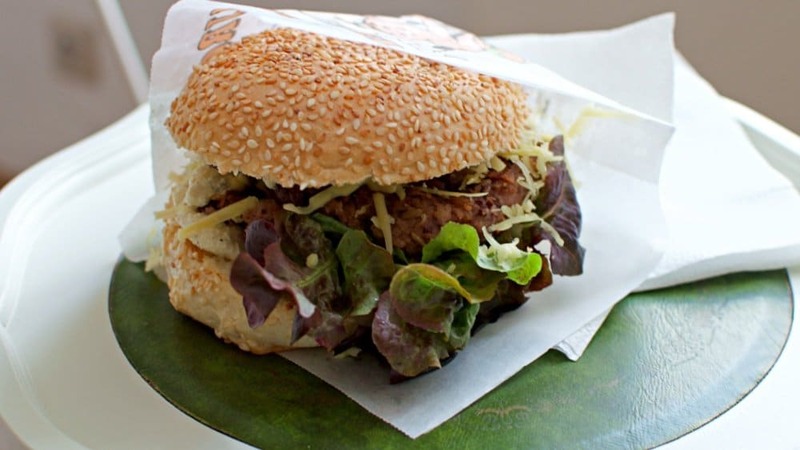 McVeg: As the name implies, it’s a takeaway fast-food restaurant selling sinfully delicious, cruelty free burgers, hotdogs, and pizzas. Tip: Try the cheeseburger (above). You won’t regret it! Miss Sophie’s Hotel Brunch: If you’re staying at Miss Sophie’s Hotel be sure to let them know you are vegan and they’ll prepare special brunch items just for you. When we were there they prepared chia seed pudding and delicious hummus for Randi among other things. Long Story Short Hostel: They offer a delicious vegan open faced sandwich on their cafe menu and will also cook up a vegan brunch for you if you’re staying with them. Ziva Zahrada: Vegan and Raw restaurant with a daily and set food menu and raw desserts, coffee, tea, juices, smoothies, and wine. The Kathmandu Nepali Restaurant: Not a vegan or vegetarian restaurant but there are plenty of options on the menu to choose from. The staff are well versed about what it means to be vegan and can guide you through the menu to choose a dish you will enjoy. Best part, they have three levels of spicy. One – Czech Spicy (not really spicy at all), Two – Medium Spicy (just right), and Three – Nepalese Spicy (the real deal). 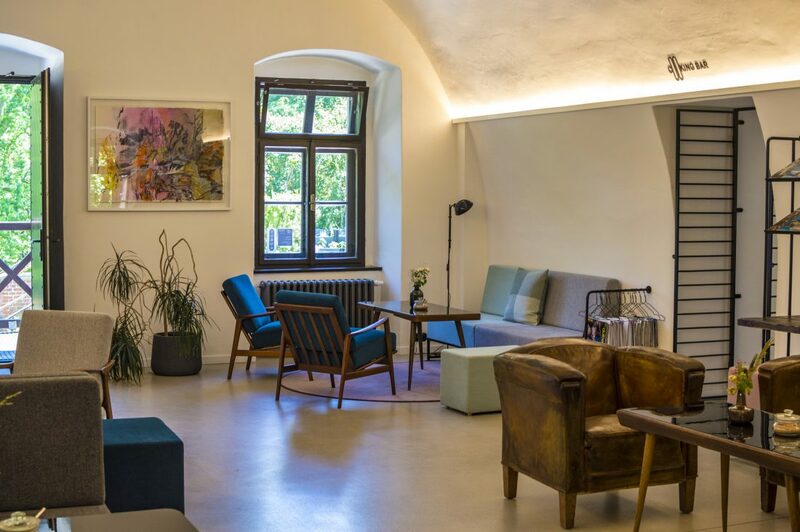 The brand new Miss Sophie’s in Olomouc is one of the most interesting hotels we have every had the pleasure of staying at and absolutely the best hotel in Olomouc. This four star boutique hotel is housed in a historic 13th century building located a mere 400 meters from the Upper Square. Each of the hotels eight oversized rooms ooze style and charm. Vintage furniture, loads of natural light, original tile floors and rustic wooden floors, gorgeous bathrooms, bright accent pieces, and lots of little touches (white Christmas lights on the bed frames!) make the rooms feel like a sanctuary for anyone staying here. Sophie’s also has amazingly friendly staff and a lovely cafe that serves up a fantastic brunch with both hot and cold options. If you have dietary restrictions, just let them know. They’ll do everything they can to accommodate you! 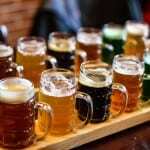 And don’t forget to sample their delicious coffee, Moravian wine, or Olomouc’s Chomout beer which they have on tap. 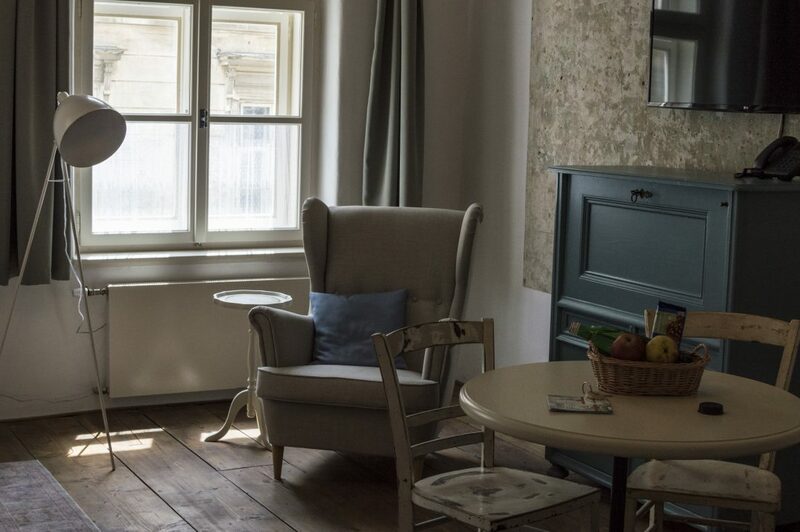 If you’re looking for a hotel with a friendly and special atmosphere, fantastic rooms, and delicious food we highly recommend staying at Miss Sophie’s in Olomouc. For more information about Miss Sophie’s Olomouc, or to read reviews click here. Friendly staff, incredible sleek design, beautiful rooms and dorms, tasty food, excellent coffee and wine. No, I’m not talking about an expensive hotel, I’m talking about the Long Story Short Hostel in Olomouc. 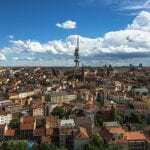 If you’re looking for budget-friendly accommodations in Olomouc with all the frills of a fancy hotel then look no further. Long Story Short Hostel is where you want to rest your head while in Olomouc. 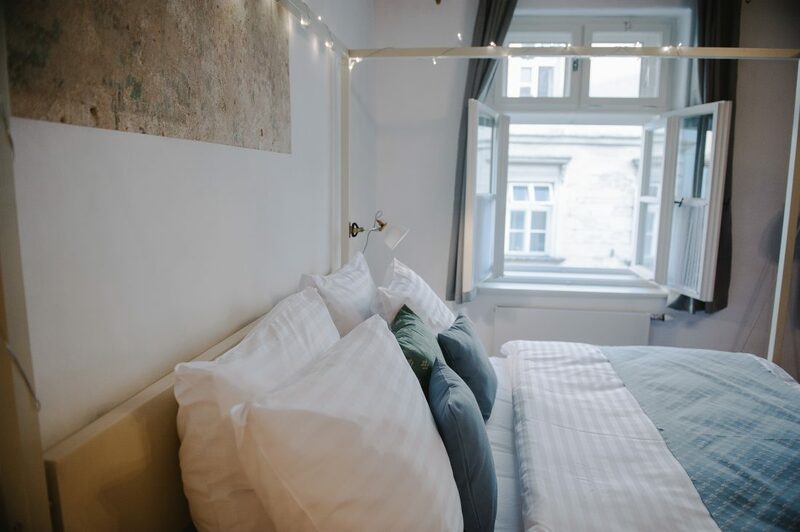 From the extremely comfortable beds, to the fancy bathrooms, to the fantastic brunch, to the uber happy and helpful staff, you’ll have a hard time tearing yourself away to get out and exploring the city when staying here. We promise, there isn’t a better budget-friendly hostel in Olomouc. For more information about Long Story Short or for reviews click here.